Fiology thanks mentor and friend Doug Nordman of The Military Guide for shaping this lesson. After years of diligent savings and being extremely aware of and planning for all fathomable downside future risks, nearing the FI finish line can be both exciting and scary. It is a great position to be in and should be all rainbows and butterflies but there is always at least some level of anxiety. If we are still able to work, should we? Continuing to work will certainly minimize the risk of the future unknown further, right? Do we take the leap, make a clean break from our previous paycheck, and fully embrace all that we dreamed FI will bring? I mean, we planned for this day and all will be well, right? This is choice causes pause for many in the FI community. 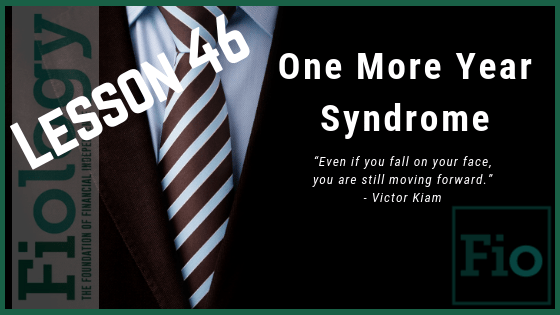 This lesson will define the One More Year Syndrome and provide a variety of viewpoints to help you reflect on your own circumstances and move forward to a decision that works best for us and our future. Note: We searched for podcasts and videos to support this concept and found little. If you are aware of any other medium supporting the One More Year Syndrome, please let us know. Take Action: No matter where we are on our FI journey, despite what logic and numbers support, we are likely to give great consideration to the decision to finally begin proving our concept of FI. With this information as a basis, continue to think about how you will interpret the many factors that make up the One More Year Syndrome. I had a one more year moment. My long planned for early retirement was set for the Fall of 2008. But the market tumbled and so did my portfolio. On top of that unemployment soared so opportunities to move on doing something I had real interest and passion to learn and do dried up. So I waited a year until it appeared the market had hit and then started to rise above it’s bottom. My one year delay did give me more confidence in my decision to finally leave when I did in Dec 2009. I was still burdened with some doubts, especially when everyone said I was crazy to do it. BTW- Thanks for “read” mention (announcing your early retirement) in your post . It really does affect us all. It’s good to hear from someone who experienced it in the trying time that you did. With the new generation of FI seekers, it will be interesting to learn from the stories as we maneuver through the next downturn. And I might just might be becoming a “Leisure Freak” as you define as: Someone who is obsessed with or unusually enthusiastic about employment liberation through financial independence.